Merry Knitmas Pomcats! This episode we're joined by our friend and ex-producer, the musical maverick that is Eli Block! We're feeling festive as we chat about the creation of the podcast, what we've been up to, everyones favourite regular feature Top Three, and there is even time for some presents. Come join us by the fire for a cosy chat! Find the show notes here! https://www.pompommag.com/pomcast-58-a-knitmas-chat-with-eli-block/ Thanks for Unravel for sponsoring this episode! This episode features an interview with illustrator and author Katie Green, along with our usual knit-chat and giggles. Thanks to Traveling Yarn for sponsoring! We have a healthy stash of news to share with you so if your needles took a break over the summer, get ready to dust them off and dive in to all the new publications that we have coming soon. We’ve got our usual features of Tell and Tell, Top Three and Text Files, plus a review of some fab yarn from our sponsors Rauwerk. Grab your knitting and get comfy! Hey Pomcats! We're enjoying a heatwave (a tropical heatwave), but we're getting prepped for the change of the seasons. While being warmed (or should that be cooled?) by thoughts of our upcoming autumn and winter publications, Lydia and Sophie bring you their exceptional blend of knitting news and puns for your enjoyment. Our guest this episode is Dana Williams-Johnson (dog jumper knitter extraordinaire), so why not pop the podcast on and join us with your knitting? Thanks to our sponsors Indie Untangled! Just like two yarns plucked from your stash and striped together to make the perfect combo, we've blended a mix of news, reviews, an interview, and knitting merriment for your enjoyment. As well as your favourite features, we're joined by the fabulous Pam Allen, founder of Quince & Co. So why not indulge your ears with over an hour of fun chit-chat, we're certain you'll feel the same happiness that you get from casting on a new WIP. Check out the Pom Pom blog for our Scheepjes giveaway! Pomcast 50- JOJI LOCATELLIi + VEERA VÄLIMÄKI! Hey Pomcats, welcome to your favourite pick'n'mix of knitty chat, including an interview with the dynamic designing duo Joji Locatelli & Veera Välimäki! We've also got Text Files and Top Three. Thanks to Ritual Dyes for sponsoring this episode! We've got festival fever as our recording comes live from Edinburgh Yarn Festival and this episode includes our Unravel interviews with Hanna Maciejewska and Zoe Fletcher. Thanks also to Woollinn Dublin for sponsoring this episode. We're hanging out with the charming and creative Francesca Kletz and Brooke Dennis who run The London Loom in this here London town. We'll be having a gander at their new book, swatching with some tasty The Wool Kitchen yarn, bringing you all the news of your favourite knitting mag and all the while providing your ears all the puns and cheering chatter that your day needs. Thanks to The Wool Kitchen for sponsoring this epsidode! The second of our Knitters in the Round discussions recorded at Pomfest this summer 2017, hosted by Anna Maltz, Discussing how we can choose to craft consciously are Bristol Ivy, Clara Parkes, Julia Billings and Julie Asselin. POMCAST 45 - Knitters in the Round: Where There's a Wool, There's a Way! For this episode we bring you a recording of the first of two Knitters in the Round discussions recorded at Pomfest this summer, and hosted by Anna Maltz. This one features Emily Foden (Viola Yarn), Emily Wessel (TinCanKnits), Olga Buraya-Kefelian (Olgajazzy), and Sonja Bargielowska (Blacker Yarns). Lydia and Sophie catch up after an exciting trip to the binder's to see Knitting Outside the Box on press, and after a trip to Yarndale! This episode features a recording of Clara Parked reading from her newest book, A Stash of One's Own. What a treat! Thanks to our sponsors Nature's Luxury. Lydia and Sophie are joined by Juju Vail - our guest editor for Autumn Issue 22! We're talking colours, cloth, skeins and sewing, plus all the gossip from the magazine. Thanks to our sponsors Woollenflower! POMCAST 42 - LIVE FROM POMFEST! Episode 40! In this episode Lydia and Sophie talk to Julie Asselin about colour inspiration and how she became a dyer. There is also all the usual podcast fun; including exciting news about a new book coming soon from Pom Pom Press, and the vendor lineup for Pomfest! Of course we also have plenty of giggles, and a travel related top 3! A bonus 'Short Rows' episode! Lydia and Sophie count down to Pomfest in July and chat to Sonja Bargielowska of Blacker Yarns, plus there is a review of Blacker's new Samite Silk Blend - ooh! Thanks to Blacker Yarns for sponsoring this Pomcast! This episode Sophie and Lydia talk to Gina Rockenwagner about her life in the world of fashion and textiles. There is also exciting news about Pomfest, and all our upcoming anniversary celebrations, and all the usual giggles. Live from Edinburgh Yarn Festival, Sophie is joined by guest host Bristol Ivy - who has an exciting Pom Pom Press announcement! This episode also includes an interview with the fabulous gals behind Spincycle Yarns. Thanks to our sponsors Erika Knight. Back with the first Pomcast of 2017, Sophie and Lydia have all the news about your favourite knitting mag and lots of giggles too! The gals chat to Daphne Marinopoulos, founder of The Fibre Company, plus there is the usual lots of chat and fun! Also thanks to our sponsors Nature's Luxury! POMCAST 34 - Christmas Cracker with Helga Isager and Julia Farwell-Clay! Merry Knitmas! Get ready for a bumper Christmas Cracker Pomcast! We've got festive cheer, Top Three, 'What Would Juju Do? ', plus two interviews this episode one with Helga Isager and one with Julia Farwell-Clay. Thanks to Unravel and Green Mountain Spinnery for sponsoring this episode. In this episode we chat with designer Dianna Walla and catch up with all the knitting gossip and news from Pom Pom magazine. Our craft agony aunt Juju answers your knitting dilemmas and our top three has a special Norwegian flair! Thanks to Blacker Yarns and Green Mountain Spinnery for sponsoring this episdoe. A bonus mini pomcast episode! Featuring an interview with the folks behind YARN - The Movie, at cinematic Top Three plus all the usual Pom Pom gossip and giggles. Our 30th is a Spooky Special for Halloween with some of your knitting horror stories! You can also expect all the usual knitting news and giggles, plus an interview with the wonderful textile artist and knitter Rachael Matthews - we chat about her new book 'The Mindfulness in Knitting'. This episode is sponsored by Pink Hazel and Green Mountain Spinnery. In this episode we talk to Caitlin ffrench about her dyeing and designing, and her soon to be released book! We also take your questions to knitting guru Juju Vail, and cover all our usual crafty topics. Plenty of giggles as usual! This episode is sponsored by Blacker Yarns. Thanks Blacker! Pomcast episode 28! For this episode our interviewee is the brilliant Tom of Holland, and as always Sophie and Lydia chat about their crafty projects, as well as the usual top 3, knitter you should know about, and other faves! POMCAST 27 - with Amy Hendrix of Madeline Tosh! Sophie and Lydia are back with our 27th episode of Pomcast. This month we have an interview with the dyer behind MadelineTosh yarns, as well as all the usual knit chat. POMCAST 26 - with Juju Vail and Thea Colman! This episode of Pomcast features a guest co-host, the one and only Juju Vail! Sophie and Juju chat about knitting, bobbins, and so much more, and we also have an interview with Thea Colman, who has the most excellent radio voice we ever did hear. Pom Pom Quarterly's podcast - Pomcast! Lydia and Sophie bring you all the usual craft related giggling, as well as some mini interviews recorded at Edinburgh Yarn Festival. You'll hear from John Arbon, Dianna Walla, Sonja Bargielowska, and Jo of EYF organisation fame! POMCAST 24 - with Rachel Atkinson! Lydia and Sophie chat to tech editor extraordinaire and Daughter of a Shepherd Rachel Atkinson. And we also have all the usual knit chat, tell + tell, knitters you should know about, top 3 and more! Pom Pom Quarterly's podcast! Sophie and Lydia bring you all the usual fun and knitting related chat, as well as an interview with Cecelia Campochiaro, author of Sequence Knitting. This episode was recorded live at unravel 2016! Lydia and Sophie chat to Veera Valimaki, and also bring you all your favourite knitting related silliness. POMCAST 21 with Sarah Corbett the Craftivist! From Pom Pom Quarterly comes Pomcast! In this episode Lydia and Sophie welcome the new year with lots of knitting chat and a thoughtful interview with Sarah Corbett - founder of the Craftivist collective. Pom Pom Quarterly's monthly podcast - Pomcast! In this episode Sophie and Lydia bring you more knit chat with a festive theme, and talk to Olga Buraya-Kefelian about her designs and inspiration! POMCAST 19 with Fiona Alice + Pom Pom Press! Sophie and Lydia return for episode 19 of Pomcast. Expect giggles, pondering and knit chat, sometimes all at once! We also reveal exciting plans about our newest Pom Pom venture, and talk to Fiona Alice, who is part of those plans! Pomcast 18 - Rhinebeck Special! Pomcast's 18th episode. Sophie and Lydia discuss their projects, as well as their top three and ravelry realness! And our special correspondent Julie Asselin (dyer extraordinaire) reports back from Rhinebeck. Listen while you knit! Sophie and Lydia talk to Emily Foden, the dyer behind Viola. They also talk knits, pet peeves, and the 'adult content' of ravelry. POMCAST 16 - with Susan Cropper of Loop, London! Pomcast hosts Sophie & Lydia chat with Susan Cropper, owner of LYS Loop in London about the shop's 10 year anniversary and the beautiful book commemorating it. As usual, we also have tell & tell, news, reviews, and top 3! Pomcast 15 brings you an interview with the amazing Melanie Gall, singer of knitting songs! As usual we have tell + tell, news, reviews and a top 3! Along with all the usual knit chat you have come to love! POMCAST 14 - with Knitsonik! Sophie and Lydia talk to Felicity Ford (AKA Knitsonik) and catch up on their Summer antics so far! POMCAST 13 - with Stephen West! Episode 13 of Pomcast! We bring you an interview with the ever fabulous Stephen West, as well as all our usual chit chat. POMCAST 12 - with Joji Locatelli! The Pomcast gals talk to the one and only Joji Locatelli! (Apologies for the crackles during this long-distance interview!) We also discuss the PPQ Temarf-Along, the new book Sequence Knitting, some great Travelling Stitches stories, and all our usual segments! POMCAST 11 - with Clara Parkes! Pomcast gals talk to the yarn whisperer - also known as Clara Parkes! (apologies for the background noise during the interview). We also discuss Edinburgh Yarn Festival and Spring knits, amongst other things! The Pom Pom gals chat to Bristol Ivy, as well as their usual reviews, top 3, and Ravelry Realness. And a whole lotta socks! POMCAST 9 - with Erika Knight! Our first podcast of 2015! We chat to Erika Knight. POMCAST 7 - with Cirilia Rose! Pomcast 7 - in which we talk to Cirilia Rose. POMCAST 6 - with Gudrun Johnston! The 6th instalment of Pom Pom's podcast! With Gudrun Johnston. 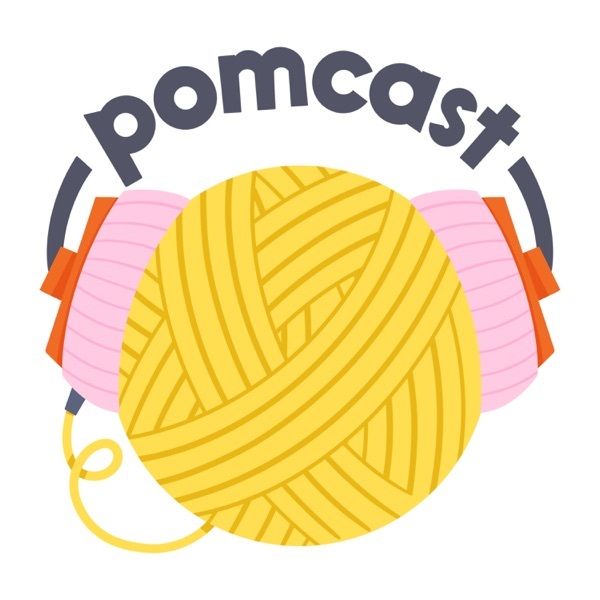 POMCAST 5 - with Emily and Alexa of tincanknits! Pomcast 5 - in which we chat to the duo behind tincanknits. POMCAST 4 - with Linda Lencovic of Kettle Yarn co.
Pomcast gals chat to Linda Lencovic of Kettle Yarn co. Also we catch up after Unwind Brighton. POMCAST 3 - with Rachel Coopey! Pomcast 3 - in which we discuss our latest knits, Pom Pom abroad and Rachel Coopey, (a.k.a. CoopKnits') latest masterpiece. POMCAST 2 - with Anna Maltz! POMCAST 1 - with Juju Vail! Knitting Podcast from Pom Pom Quarterly.